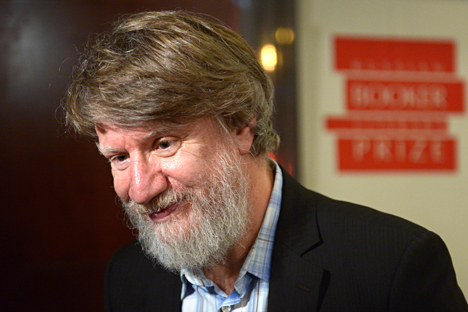 Russian writer and essayist Vladimir Sharov, 62, made his debut as a poet back in 1979. With his big white beard, the author bears an uncanny resemblance to Leo Tolstoy. His books are imbued with biblical motifs and attempts at rethinking Russian history. Russia Beyond the Headlines: What does it mean to you to receive the Russian Booker Prize? Vladimir Sharov: For me, the prize is an opportunity to be read by a much larger number of people. It will be a lot easier to form relationships with Russian and foreign publishers, because they equate receiving a prize to having a wide readership. It will also be easier to form relationships with translators, and a translator is the most important thing there is for a writer. When someone else works almost at your rate, rhythm and immersion in the text, it gives you the opportunity to simply live. RBTH: Can you briefly explain to foreign readers what your novel “Return to Egypt” is about and how you arrived at the plot? V.S. : At some point, I started to think that the entirety of Russian life and history in the 20th century, and even in the second half of the 19th century, was an attempt to finish Dead Souls – the second part that Nikolai Gogol burned and the third one that was never written. There were attempts by writers, and later attempts by the authorities, which ended with an enormous amount of blood and much else besides. That became people’s understanding of Gogol – people who were distanced from him by two or three generations, who saw and lived through many things. RBTH: Would it be fair to say that your work – particularly “Return to Egypt” – is only for intellectuals, rather than everyone? V.S. : It’s hard for me to say. When someone is writing a novel they possess a certain amount of power within its bounds. But once a novel is published, the author is the last person who matters. And I think that they shouldn’t even comment on the text. They should just listen to the people who read it. There is a huge difference between what you write at the time and what you have actually written. RBTH: Who is your readership? Do you write for anyone in particular? V.S. : I don’t write for any particular reader. For me, the process of writing a book is an attempt to understand the things that remain obscure to me. By the end it seems that I have started to at least partially understand some things, although that feeling does fade rather quickly. It’s that kind of tool for me: if I write for anyone, it is only for myself. But, of course, it’s always a gift to me when someone else reads my work and talks to me about it, or draws, translates, or publishes something I have written. A novel is like a child. You understand some things about it when it is still inside you, but as soon as the umbilical cord is cut, another life begins, and you just want it to turn out well. You no longer have any control and must modestly step aside. RBTH: Do you identify with any particular literary movement? V.S. : For me, Andrei Platonov is most important 20th-century writer – and not just in terms of Russian literature. But whenever I really like something, I don’t want to duplicate it. I simply take a step back and admire it. I just have some questions and confusion, and I try to deal with them. I would rather like to think that I am partially a chronicler of times I didn’t live in but am trying to restore. A huge part of that time was simply lost in the Civil War. It wasn’t recorded, put into an archive, or even burned in stoves. And, just like a hunter tracking an animal can determine what type of animal it is, or like a paleontologist can rebuild an entire animal from a bone, what I write is an attempt to restore the life not captured in the archives – simply the fluid, unwritten human life. RBTH: In his column on the short-list for another literary prize – the Big Book Prize – the writer Pavel Basinsky wrote that contemporary prose refers to times past, other countries and spaces. And he asks the question, “Has life become boring?” What are your thoughts on that? V.S. : I can’t answer for everyone, but personally I need distance – at least 30-40 years – if I am to lift my hand to write about something. During their lives people have countless experiences and feelings: they talk, work, go to the theatre, go out, and then they write it down in a diary, and the words end up depicting a totally different sense and value than what they actually felt when they lived it. I am not a person of momentary impressions. I need them to settle. Life moves too fast to write it down in shorthand. RBTH: Excuse an indiscreet question: the Russian Booker Prize is 1.5 million rubles. Have you already thought about how you will spend it? V.S. : I’m just going to live. A novel takes five-six years to write, so if you divide the prize by years, it’s not that much. I don’t think my life will change. I will simply be freed from thoughts about what I’m going to live on.